You are here: Home / Blog / Adulting / Craft Biz + Blogging / How to make Banners for your Etsy Shop using PicMonkey! How to make Banners for your Etsy Shop using PicMonkey! Are you a creative mama with your own Etsy shop? Even if you aren’t a mama, if you own your own crafty/creative biz with a storefront on Etsy, I’m sure you know the importance of Etsy Banners and the huge Etsy Cover photos! Branding your shop with its own Etsy banner, logo, thumbnail pic, consistent style of product imagery, etc…. Well, it can seem overwhelming. Getting your shop to look good is a lot of work! And, as I’ve learned, a lot of store owners have no idea how to design banners or logos on their own. So what do they do? They outsource. (What, what??) In other words, they pay someone else on Etsy to design banners and/or cover photos for them. Even my very best friend, and super-successful Etsy shop owner, Courtney, (you can learn her success tips here) purchased her custom-made shop banner from another creator. (Gasp!) Not that it’s crazy, because apparently it’s a pretty popular practice. But this crafty mama right here, is all about learning how to DIY new things! One of the greatest things I’ve learned about since diving into this blogging adventure – is PicMonkey. PicMonkey has changed my life. Seriously. Not just as a blogger, but also as an Etsy shop owner. You see, I never thought I could afford the be-all-end-all editing program Adobe Photoshop. So because I never invested in Photoshop, I thought editing pictures and designing logos or digital prints was, well, out of my reach. Discovering PicMonkey completely changed that mindset. With PicMonkey, I can not only edit my drawings and turn them into digital prints for my Etsy shop, but I also easily designed my own Etsy banner and thumbnail image. It’s also what I use to create, edit, and enhance ALL my blog and Pinterest images. PS: If you’re having trouble viewing the images, please let me know! Go to www.picmonkey.com (of course) and hover over the top bar as if you’re going to pick “Design“. The menu will pop down and then you’ll click “Blank canvas“. 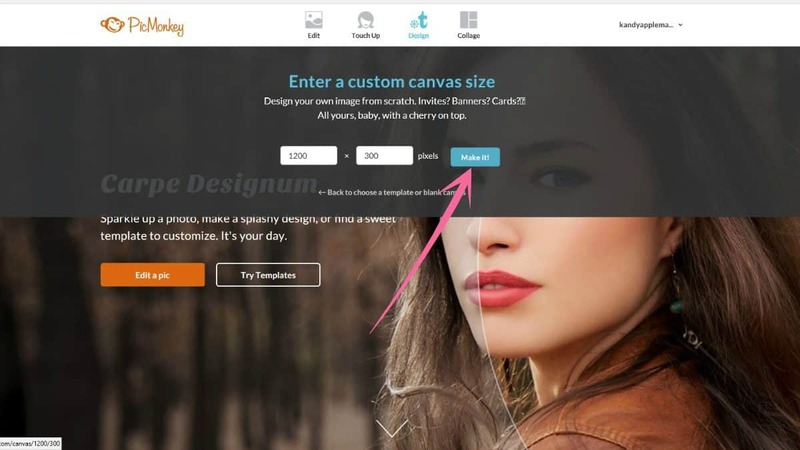 Step 2 – Choose a custom sized blank canvas. Since we’re creating the big Etsy banner, we want the dimensions to be just right so that when we upload it, there aren’t any issues. 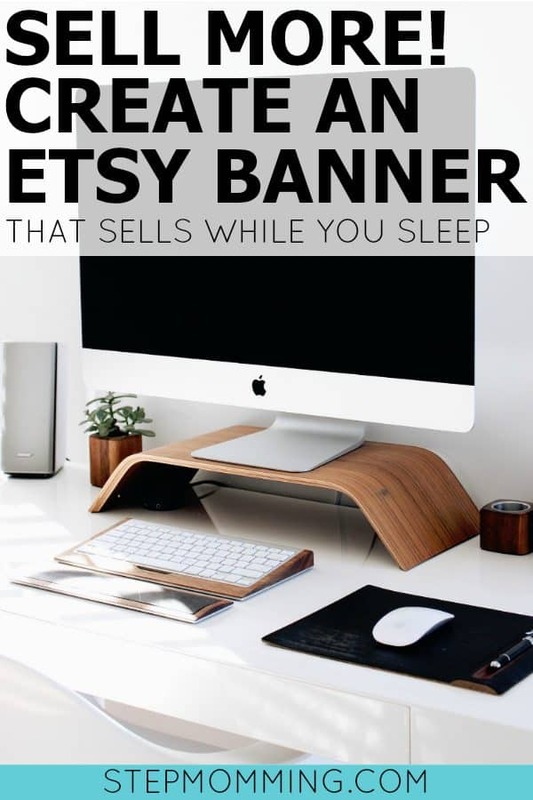 An Etsy banner’s dimensions must be at least 1200 x 300 pixels. So input those dimensions, and click “Make it“. It’s now time to create! Since this is YOUR design for YOUR shop, of course you have free reign. What are your shop colors? What are you favorite kind of designs? For our Etsy shop design, I like to stick to rectangles, like I do with our blog images. I’m also pretty particular about our colors. So first, I want to add a border that I can move around. 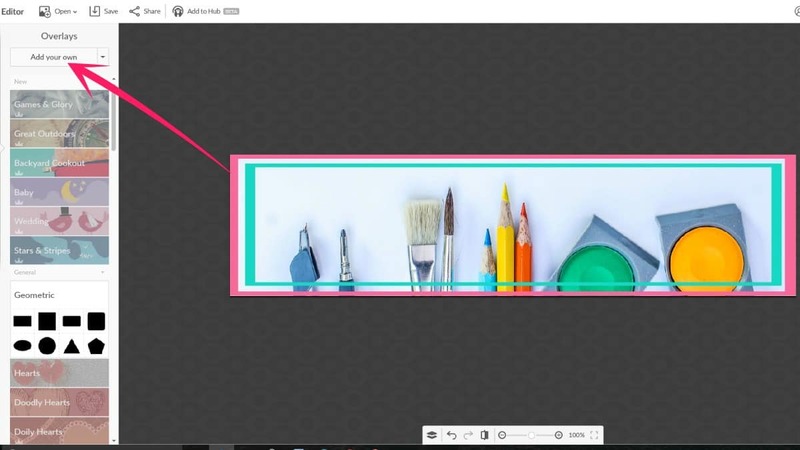 There is an option to add a “frame” to your creation (you can see a picture of a frame in the far left toolbar) but you can’t move those around. So instead, I click the butterfly image (also known as “overlays“). In the “overlays” section, you have a TON of choices. If you want to add a shape like I did, go to “General” then “Geometric“. Choose the rectangle shape. 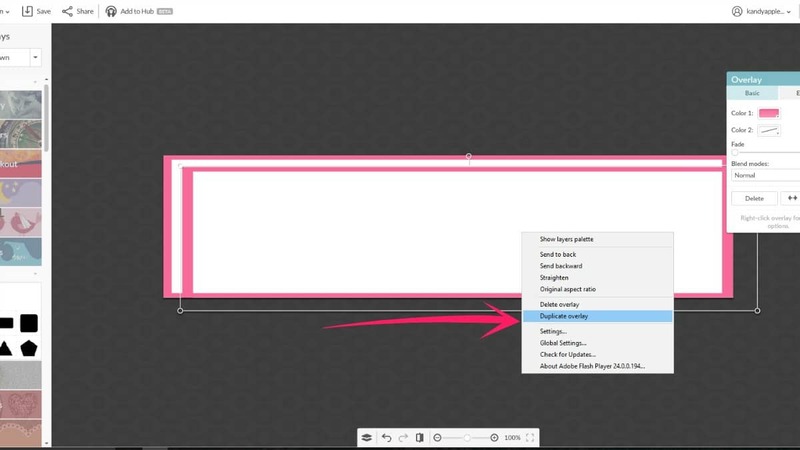 With every geometric overlay, you have the option of choosing a “fill” color and an “outline” color. I almost always leave the fill color transparent and then color the border only. I like creating a pink border, with a turquoise rectangle a little further in. To do this quickly, I right click the pink rectangle and choose “Duplicate Overlay“. Whatever you choose to do this to, will be automatically replicated. From here, I change the second rectangle’s color to my favorite turquoise. You can also add your OWN overlays (if desired), including .png or .jpg files. Simply click “Add your own” under “Overlays” and choose whatever image you want from your own computer files. This comes in handy particularly when you want to add watermarks to photos you plan to display on Etsy, that you don’t want others to steal. Now we need to add our shop name! In the far left toolbar, click the “Tt” option for “Text“. Now choose the “Add text” button at the top. From here you can add whatever title, shop name, or text you want. They have quite an arsenal of font options on PicMonkey. You’re also able to change the font color, size, alignment, and many more options that I don’t have time to go over. You’ll just have to experiment for yourself to see ALL the options. One of my most-often used font options when I’m using PicMonkey, is the drop shadow effect. Simply click your text you want to add the effect to, and choose “Effect” in the text options panel. It’ll automatically go to the drop shadow option (there are others, but this is the default one). You can choose what color you want the shadow to be, the distance away from the text, the intensity, angle, and more. Again, just experiment to see what you like. Step 8 – Adding more text! Add another line of text. In my opinion, shop banners look a lot more fun where there’s more to read and therefore, more to look at. Mix your fonts up a little, but don’t go too crazy (you can change every word to a different font, but I wouldn’t recommend this). But the stark white felt too plain. So, I started looking through what other overlays PicMonkey has to offer. I enjoy using the “Correction Marks” options under “Scrapbooky” overlays, so I started adding a few. I also like using the “Dashed & Lined” options, so I added a few more of them as well. Also, keep in mind that changing an overlay or text’s layer is super easy. When I added the dashed lines, I moved them to the back so they looked like they were underneath my rectangle borders. Just right click and choose “Send to back“. PicMonkey also offers a lot of different choices under “Banners“, not to be confused with “Engraved banners“, “Labels“, “Victorian Labels” and others… Trust me, there is a LOT to choose from. I tried adding a “banner” to our Etsy cover photo, but I didn’t like it either. Making the perfect shop banner can take time. You don’t want to rush throwing something together. Be sure to choose elements you love, and your customers will love it too! Here’s a screenshot just so you can see what the “Victorian Labels” look like. There are also overlays for everything from facial hair, to barbecues, from general designs, to nature choices. In fact, PicMonkey has hundreds if not thousands of overlay options. Visit the site here to see for yourself. PicMonkey also has a “Theme” option in the far left toolbar. Click on the image that looks a bit like a snowflake (hence the “Winterland” theme being the first option). I added the rectangular paper overlay and sent it to the back as a background. You should also know that a background like this is also available as a “Texture“. On the far left toolbar, the icon above the Theme snowflake, is the “Textures” icon. Choosing a texture, however, doesn’t cover up a background image. It changes the background image to look like the texture you’ve chosen. Personally, I prefer overlays. Back to the overlays PicMonkey creates specifically for its themes, I actually really liked what the “School U” theme offered. I used the “Up Notes” options on top of the paper background to give it more of a notebook feel. Feel free to play around with whatever you like. Like I said, this is YOUR shop cover photo, so YOU are the artist. Are there any other last touch-ups you’d like to fix before we save the masterpiece? I decided to change the font style of our second line of text to one of the “School U” fonts so that it looked more like handwriting. It pulls the whole thing together, don’t you think? Step 14 – Save your masterpiece! Now SAVE YOUR WORK! I don’t care if you save it to your desktop, a Dropbox, or your computer’s hard drive. Just make sure you know where it is so we can upload it in a sec. In case you’re wondering how, you’ll first need to fill out the “File name” section and choose whether you want it to be a .jpg or .png. For our purposes today, you’ll probably want to save it as a .jpg. Under the “Quality” section, you have the option to save it as low quality (Roger), medium quality (Pierce) or high quality (Sean). (Not really sure why they’re named that way, but who cares!) I usually stick with the Pierce option, unless I’m creating something I want people to be able to print out and see detail, then I’ll choose Sean. Leave the “Dimensions” section alone. It’s already at the perfect size for our Etsy banner cover photo. Now click “Save to my computer“! Step 15 – On to Etsy! Hover over “Your Shop” and click the “Edit Shop” button. Once it takes you to the “editing your shop” page, click the link at the top to “Add a cover photo to highlight your brand“. Which is exactly what we’re going to do! Step 16 – Upload time! Next, Etsy’s going to give you 3 options: Small banner, Cover photo, or None. We want the big mamma-jamma option! Choose “Cover photo” and click the blue “Add cover photo” button. From here, it’ll let you choose the file you just saved to your computer. I hope you remember where you saved it! Now hit the blue “Save” button!!! So what do you guys think? 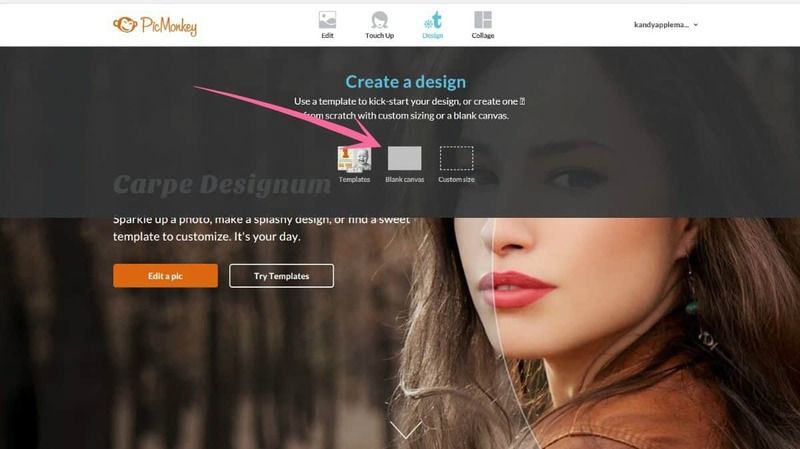 Does PicMonkey look as awesome and user-friendly as it sounds? What’s even better, is that much of what PicMonkey offers can be used totally free. Some of the options, specifically the “Royale” ones, are only available if you upgrade to the Royale membership. But even if you sign up, it’s only $39.99 for an entire year. Which is absolutely worth it for how much I use it! If you or someone you know could use a tutorial like this, be sure and share it on social media! Would you guys like me to create more tutorials like this? Let me know in the comments. It could be how to create a thumbnail image, or logo, or even how to create Pinterest-optimized images! I’m all ears, so let me know what you think would be the most interesting to learn.